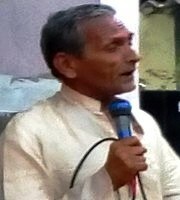 Dr. Raja Nand Jha (b. 1946) is a poet, lyricist, multi linguist and award winning translator. He retired as a professor of English from L.N. Mithila University Darbhanga. He is a bilingual poet and writes in both English and Maithili. He has authored 15 books of Maithili and English Literature. He is conferred with Sahitya Akademi Award for Translating Bengla Novel, “Kalbela” into Maithili.